Wiper blades are components that are subject to wear and tear. Replace the wiper blades twice a year, preferably in the spring and fall. Otherwise the windows will not be wiped properly. As a result, you may not be able to observe surrounding traffic conditions and could cause an accident. - Turn the combination switch to the appropriate position or press the button on the side. 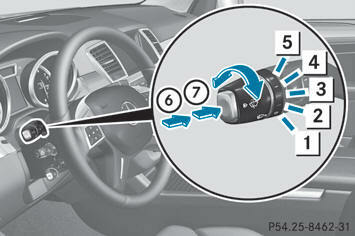 – Turn the SmartKey to position 1 or 2 in the ignition lock. – Slide switch 1 on the combination switch up or down to the appropriate position. For safety reasons, switch off the windshield wipers and remove the key from the ignition lock before changing the wiper blades (vehicles with KEYLESS-GO: make sure that the on-board electronics are in state 0). Otherwise, the wiper motor could be switched on suddenly and cause injury. Never fold a windshield wiper arm without a wiper blade back onto the windshield/rear window. Mercedes-Benz recommends that you have the wiper blades replaced by a qualified specialist workshop, e.g. at an authorized Mercedes-Benz Center. - Fold the wiper arm away from the windshield. 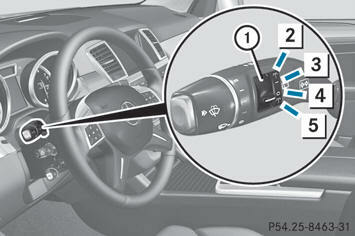 - Firmly press release knob 1 and pull the wiper blade upwards from the wiper arm in the direction of the arrow. - Position the new wiper blade in the retainer on the wiper arm and slide it into place in the opposite direction to the arrow. - Make sure that wiper blade is seated correctly. - Fold the wiper arm back onto the windshield. The wiper arm could be set in motion and injure you if the wiper is switched on. Remove the key from the ignition lock before replacing the wiper blade. - Fold wiper arm 1 away from the rear window until it engages. 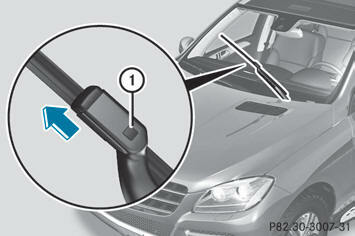 - Position wiper blade 2 at a right angle to wiper arm 1. - Hold wiper arm 1 and press wiper blade 2 in the direction of the arrow until it releases. - Remove wiper blade 2. - Place new wiper blade 2 onto wiper arm 1. - Hold wiper arm 1 and press wiper blade 2 in the opposite direction to the arrow until it engages. - Make sure that wiper blade 2 is seated correctly. 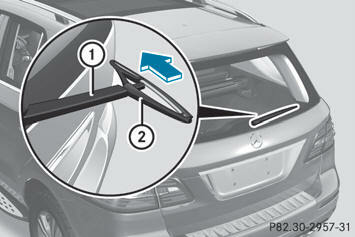 - Position wiper blade 2 parallel to wiper arm 1. - Fold wiper arm 1 back onto the rear window. - For safety reasons, you should remove the SmartKey from the ignition lock. - Switch off the engine using the Start/Stop button and open the driver's door. - Remove the cause of the obstruction. - Switch the windshield wipers back on. - Select another wiper speed on the combination switch. - Have the windshield wipers checked at a qualified specialist workshop. The windshield washer fluid from the spray nozzles no longer hits the center of the windshield. The spray nozzles are misaligned. - Have the spray nozzles adjusted at a qualified specialist workshop.